My kids love to write, especially my daughter. She’s always getting into my cupboards, looking for envelopes, sticky notes, or paper. The kids have their own art cupboard, but for some reason, they like my things best. Today we created a writing center, just for the kids. 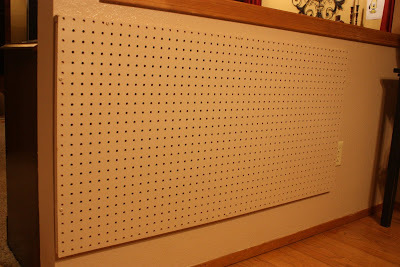 We started with some pegboard and a little trim from Lowe’s. 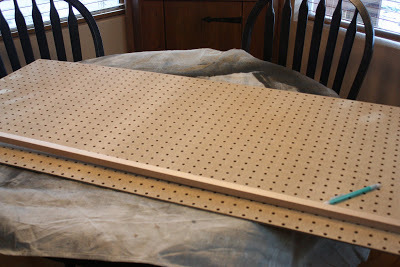 The pegboard was precut to 2’x4′. The nice people at Lowe’s can cut the trim, but I just cut mine with a hand saw. I made a frame to go around the edges. In the interest in saving a few cents, I just used a small piece on the bottom. No one will see the bottom and it just needs to be pushed out from the wall a little. 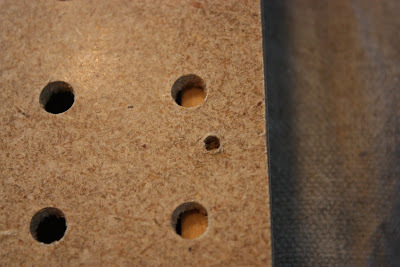 I drilled pilot holes in the pegboard and trim, to keep the wood from splitting. I bought a few accessories in the pegboard department at Lowe’s. The clear wall file holders came from Staples. I used my Silhouette to cut the vinyl letters. I painted the board the same color as the wall. I wanted it to blend in. Then came the fun part. The kids helped me add the bins. I hit the dollar store on the way home and bought envelopes, sticky notes, blank cards, notepads, and stickers I also made a few blank books and put those in a bin. My daughter is in kindergarten and loves to make her own books. 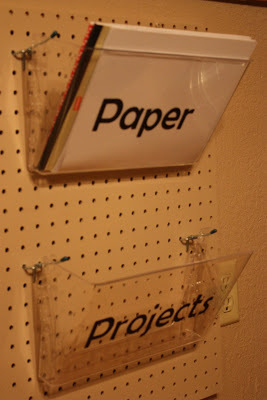 The two wall file bins are for paper and projects. Blank paper is always a must in the writing center. The project bin is for all of the works-in-progress. 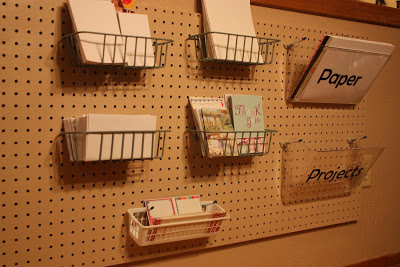 We always have cards we are working on, books in progress, and letters that need addresses and stamps. As a final touch, we added a hanger for sight words. My daughter’s teacher sends her sight word cards home as they learn them in class. This will be a great tool to have close by! The new writing center was used within the first 2 minutes of completion! Here are some linky parties I like to participate in. I love how organized everything is now! It's great that your kids love creating so much! Thanks for sharing. What a fun idea! I bet the kiddos spent all night there Thanks for joining the party! I bet your children a having a great time at the writing center! My own kids love to 'publish' their own books and then share them at school. I would have loved to have had one of these areas when my children were younger! Great idea and I really like the look of it. Completely fabulous! Thanks for sharing such a great idea! Such a great idea!! This would be perfect for my 5 year old. This is such a neat idea how it's low to the ground!! LOVE it! Thanks for sharing! I love this! I had a question about the hooks. 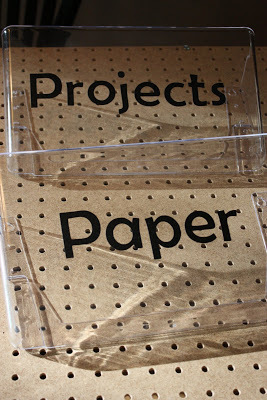 I wanted to incorporate this into my Kindergarten classroom and got the hooks. Did you use a special kind of basket…the ones I tried tended to tilt downwards. Also where did you buy the the baskets with the hooks on the back? Thanks for your help!!! 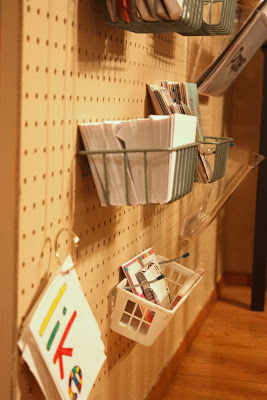 I like the hooks and bins that you can buy in the pegboard section of the home improvement stores. 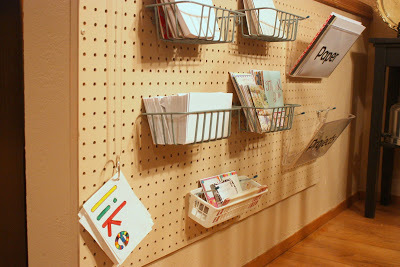 I tried to use hooks and my own bins from the dollar store, but the bins that are made for pegboard work best. Fantastic! Thanks for sharing this wonderful idea! I'm making this now! 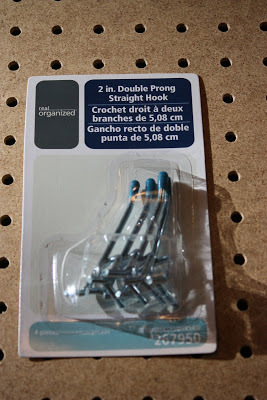 Wondering, where did you get the little wire baskets that look like they were made for peg boards? 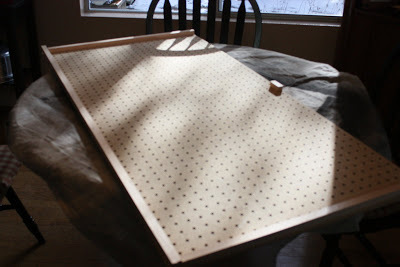 I didn't see any at Lowes when I got the peg board. I'd also be interested in knowing where you bought the wire baskets. 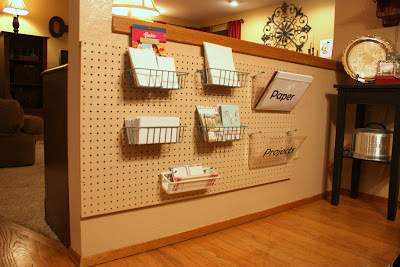 I've been unable to find something like that made just for pegboard.